The aim of the study was to assess the influence of co-existing atrial fibrillation (AF) on inflammatory condition factors, left ventricular function, clinical course and the efficacy of statin treatment of congestive heart failure in the course of dilated cardiomyopathy (DCM). In a prospective, randomized, open-label study, 69 patients with DCM and left ventricular ejection fraction (LVEF) ≤40% were divided into two groups, with and without AF, who were treated according to the recommended standards. 68% of patients from the group with AF and 59% of patients from the group without AF were administered atorvastatin 40 mg daily for 8 weeks and 10 mg for next 4 months. Clinical examination with the assessment of body mass index (BMI) and waist size were followed by routine laboratory tests, measurement of concentration of tumor necrosis factor (TNF-α), interleukin-6 (IL-6), and IL-10 in blood plasma, N-terminal pro-brain natriuretic peptide (NT-proBNP) concentration in blood serum, echocardiographic examination, and the assessment of exercise capacity in 6-minute walk test (6-MWT). After six months, morbidity rate and the number of heart failure hospitalizations were also observed. In the whole population of patients, a significantly higher concentration of NT-proBNP was observed in the AF group (2669 ± 2192 vs 1540 ± 1067, p = 0.02). After statin treatment, in patients with DCM and co-existing AF, higher values of NT-proBNP and IL-6 were observed compared to non-AF patients (1530 ± 1054 vs 1006 ± 1195, p = 0.04 and (14.16 ± 13.40 vs 6.74 ± 5.45, p = 0.02, respectively). In patients with DCM and co-existing AF, a weaker effect of atorvastatin concerning the reduction of IL-6 and NT-proBNP concentration was observed than in patients without atrial fibrillation. Atrial fibrillation (AF) is the most commonly encountered cardiac arrhythmia and is directly or indirectly responsible for considerable mortality, morbidity and health care burden [1, 2]. Hypertension, coronary artery disease (CAD), and cardiomyopathy represent the most prevalent underlying pathologies of AF and congestive heart failure (HF), implying a coincidence of both in many patients [2–4]. According to the European Society of Cardiology (ESC) 2007 guidelines , dilated cardiomyopathy (DCM) is recognized based on dilation and systolic dysfunction of the left ventricle unless a patient simultaneously suffers from CAD, hypertension, valvular heart disease or congenital heart disease which is so significant that it leads to an observed pathology of the myocardium. Within the last few years, more and more evidence has been presented that autoimmunological processes, cellular as well as humoral ones, are involved in the pathogenesis of DCM . The prevalence of AF with a progressive degree of congestive HF is increasing, as judged by New York Heart Association (NYHA) functional class [7, 8]. Moreover, the presence of congestive HF has been identified as one of the most powerful independent predictors of AF, with a sixfold increase in relative risk of its development [7, 8]. On the other hand, AF can cause or significantly aggravate symptoms of congestive HF in previously asymptomatic or well-compensated patients [3, 7]. Recent investigations of the physiological and structural changes of the atrial myocardium ("electrical and structural remodelling") have shown that neurohumoral activation, fibrosis, and apoptosis are demonstrable with both diseases. On the other hand, experimental data suggest that the substrates of AF in congestive HF are different from those of pure atrial tachycardia-related forms of AF [3, 7, 8]. Statins inhibit the enzyme of 3-hydroxy-3-methylglutaryl coenzyme A (HMG-CoA) reductase and, at the same time, the synthesis of cholesterol . The pleiotropic effects of statins may be connected with their basic mechanism, that is the inhibition of HMG-CoA reductase. In this mechanism, not only is the synthesis of cholesterol reduced, but production of the derivatives of mevalonic acids, isoprenoids is reduced as well [9–11]. Limiting the production of isoprenoids, statins block the function of cytoplasmic regulatory proteins, namely GTPases from the Rho protein family, such as Ras, Rac1 and Rap. As a result, they positively influence the course of intracellular reactions connected, among other things, with inhibiting the hypertrophy and remodelling of the myocardium. The blockade of Rac decreases the vascular and myocardial oxidative stress through the inhibition of nicotinamide adenine dinucleotide phosphate (NAD(P)H) oxidase activation [9–12]. The deteriorating circulatory insufficiency is characterized by increased amounts of free radicals, which may inactivate nitric oxide (NO). Therefore, additional advantages of Rho protein inhibition are also connected with the increased endothelial synthesis of nitrogen oxide and reduced expression of endothelin-1 (ET-1), which has a positive effect on endothelium function [13–15]. In addition, they inhibit the synthesis of inflammatory cytokines and chemokines, improve autonomic function, and reverse myocardial remodelling [16, 17]. Because of the pleiotropic effect of statins, there are attempts to use this group of medicines also in the treatment of patients with AF accompanying DCM. Therefore, the aim of our study was to assess the influence of co-existing AF on inflammatory condition factors, left ventricular function, clinical course and the efficacy of statin treatment of cardiac insufficiency in the course of DCM. In a prospective, randomized study 69 patients (men and women aged 18 years or older) with DCM (according to ESC 2007 ) with a left ventricular ejection fraction (LVEF) ≤40% as documented by echocardiography were included. Patients had been on stable doses of HF medications for three weeks before enrollment. Mean disease duration was 2.56 ± 1.98 years. None of the patients had significant CAD (defined as >30% obstruction diagnosed during cardiac catheterization performed during the one year before enrolment) or hypertension. The exclusion criteria were as follows: blood pressure (BP) ≥140/90 or <90/60; congenital heart disease; acquired valvular disease with the exception of mitral incompetence secondary to left ventricular dilatation; HF with NYHA class IV; statin treatment before the inclusion; preserved hyperactivity of aminotransferases with unexplained aetiology; muscle disorders which might cause drug-induced myopathy; uncontrolled diabetes; liver diseases; creatinine level >2 mg/dl and/or glomerular filtration rate (eGFR) <30 ml/min; alcohol or drug abuse; chronic inflammatory diseases; pregnancy or lactation; severe hypothyroidism; immunosuppressive treatment; operation or severe injury during the last month; vaccination during the last 3 months; heart stimulation device or implantable cardioverter defibrillator (ICD) and patients who did not provide written informed consent. After inclusion all patients were randomized to groups A and B. It was an open-label study. Group A consisted of 41 patients (93% males) of mean age 56 ± 10 years, who were administered atorvastatin 40 mg daily for 2 months (8 weeks) and next 10 mg for 4 months. Group B consisted of 27 patients (74% males) of mean age 59 ± 14 years, in whom DCM was treated according to present standards  without statin therapy. Next, they were divided to 2 groups: the group with AF, and the group without AF (non-AF group). AF group consisted of 25 patients (male - n = 22, 88%) of mean age 57 ± 10 years. Non-AF group consisted of 44 patients (male - n = 37, 84%) of mean age 59 ± 13 years in whom DCM was treated according to current standards . 68% (n = 17) of patients from AF group and 61% (n = 27) of patients from non-AF group were administered atorvastatin 40 mg daily for 2 months (8 weeks) and next 10 mg for 4 months. A full clinical examination including the assessment of body mass index (BMI) and waist size was followed by routine laboratory tests, measurement of tumour necrosis factor alpha (TNF-α), interleukin 6 (IL-6), and IL-10 concentration in blood plasma, measurement of N-terminal pro-brain natriuretic peptide (NT-proBNP) concentration in blood serum, echocardiographic examination and the assessment of exercise capacity in 6-minute walk test (6-MWT). During 6-months' observation, the frequency of hospitalizations due to cardiovascular symptoms, mortality and causes of death were assessed; all patients were also classified according to NYHA class. The consent of the Bioethics Commission of the Medical University of Lodz, Poland, number RNN/54/07/KE was obtained. Written informed consent was obtained from all patients. The research was financed from the grant of the Medical University of Lodz, Poland, No. 502-11-585. Blood glucose was measured with a glucose dehydrogenase method after precipitation of proteins by trichloroacetic acid. Low-density lipoprotein (LDL) and high-density lipoprotein (HDL) fractions were separated from fresh serum by combined ultracentrifugation and precipitation. Lipoprotein fraction cholesterol and triglycerides were measured enzymatically. The concentration of NT-proBNP was determined using an Elecsys 2010 analyser (Roche Diagnostics, Warsaw, Poland). After the blood was taken, the material was centrifuged; the obtained serum was frozen at the temperature of -70°C and stored in this condition until the moment of examination. The determination of NT-proBNP in blood serum was performed with the electroluminescence method with two polyclonal antibodies directed against NT-proBNP within epitope 1 (1-21 amino acids sequence) and epitope 2 (39-50 amino acids). Concentration values are given in pg/ml. Determination of IL-6 and 10 as well as TNF-α was performed with reagents from Beckman Coulter (Paris, France), using a sandwich ELISA assay (enzyme-linked immunosorbent assay) . According to the recommendations of the producer, blood was taken on EDTA as an anticoagulant. After that, it was centrifuged for 15 minutes. The obtained plasma was frozen at the temperature of -70°C until the moment of examination. on completion of 6 min, patients were instructed to stop and total distance covered was calculated to the nearest metre. Echocardiography was performed using Sonos 5500 (Agilent Technologies Inc., Hewlett Packard, Andover, USA) with a 3-11 MHz probe. Left ventricular systolic function and cardiac dimensions indexed to body surface area were determined. The heart was imaged in parasternal short axis view to obtain LV wall thickness and parasternal long axis view to measure EF, which was determined with Simpson's rule: EF = (LVEDV-LVESV)/LVEDV, where: LVEDV - left-ventricular end-diastolic volume, and LVESV - left-ventricular end-systolic volume . Left ventricular end-diastolic diameter (LVEDD) and left ventricular end-systolic diameter (LVESD) were measured from M-mode tracings. Parameters of flows were assessed in Doppler examination (continuous, pulsed and colour) . Diastolic function of the left ventricle was assessed using the parameters of mitral inflow registered with pulsed wave (PW) Doppler in 4-cavity apical projection and diastolic speed values of movement of the mitral ring registered with tissue Doppler imaging. The STATISTICA software (StatSoft, Warsaw, Poland) package was used for statistical analysis. All values presented are the mean ± standard deviation for continuous variables and the percentage of total patients for categorical variables. The Shapiro-Wilk test was used to assess normality of distribution of the analyzed features. To compare groups Student's t test or two-way analysis of variance (ANOVA) for continuous and discrete variables with normal distribution and non-parametric Mann-Whitney U test if the distribution was not normal were applied. For categorical variables chi-square test or Fisher's test for small samples were applied for comparisons. For quantitative variables (continuous and discrete) to check correlations between variables Spearman's rank correlation coefficient was used. Results were considered statistically significant at p < 0.05. Baseline patient demographics and characteristics are presented in Table 1. There were no significant changes between groups (AF vs. non-AF) according to HF signs after eligibility. As the most frequent finding, 43% of patients from non-AF group and 52% from the AF group suffered from dyspnoea. In patients with co-existing AF, warfarin and digoxin treatment were applied significantly more frequently (96% vs 6.8%, p = 0.03 and 56% vs. 9%, p = 0.03, respectively). During the study, one patient needed reduction of carvedilol doses, in two patients digoxin was administered after 8 weeks, and angiotensin converting enzyme inhibitor (ACE-I) was weaned because of hyponatremia in one patient. No patient had left ventricular hypertrophy, defined as enlargement of the diastolic dimension of the interventricular septum and/or posterior wall>1.2 cm. ABBREVIATIONS: BMI - body mass index; HR - heart rate; AF - atrial fibrillation; NYHA - New York Heart Association; 6-MWT - 6-minute walk test, ACE-I - angiotensin-converting enzyme inhibitor; ARB - angiotensin II receptor antagonist; LA - left atrium; LVEDD - left ventricular end-diastolic diameter; LVEF - left ventricular ejection fraction; LVESD - left ventricular end-systolic diameter; LVEDV - left ventricular end-diastolic volume; LVESV - left ventricular end-systolic volume, TNF-a - tumour necrosis factor-alpha; IL - interleukin; NT-proBNP - N-terminal pro-brain natriuretic peptide. Dimension of left atrium was assessed in longitudinal parasternal projection (M-mode) (>4.0 cm LA enlargement was recognized). No patients had diagnosed restrictive mitral inflow pattern. No significant differences concerning LVEF, left chamber size and volume, or the degree of mitral incompetence were observed between the examined groups. In the whole population of patients, the NT-proBNP level was significantly higher in the group with AF (2669.4 ± 2192 vs 1540.7 ± 1513; p = 0.02). 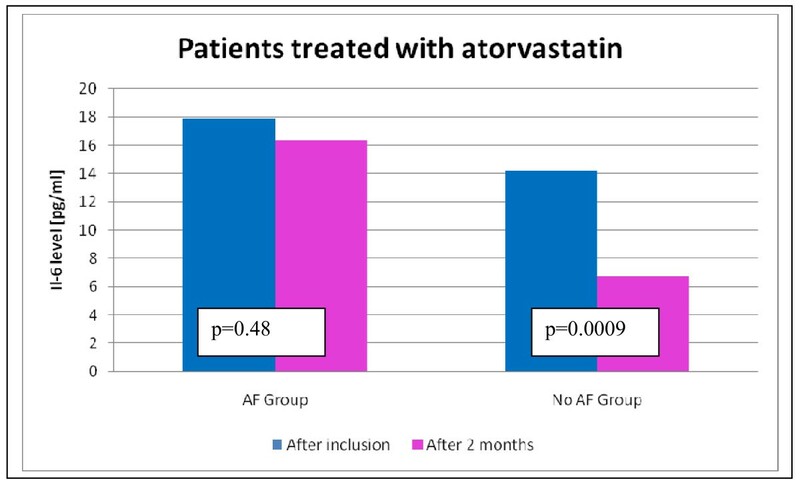 We divided patients who were treated with atorvastatin according to co-existence or not of AF and compared these groups. We assessed inflammatory state, HF signs, NT-proBNP level and echocardiographic parameters before and after 2 months of statin therapy, which is presented in Table 2. In non-AF patients, a higher reduction of IL-6 concentration (from 16.32 ± 12.76 to 6.74 ± 5.45; p < 0.001) as a result of statin treatment was observed than in patients with AF (17.91 ± 17.42 to 14.16 ± 13.40; p = 0.48) (Figure 1). In the group with AF as well as in non-AF group, a decrease in NT-proBNP concentration was observed. In patients with DCM and co-existing AF statin treatment, higher values of NT-proBNP and IL-6 were observed than in patients without AF (1530 ± 1054 vs 1006 ± 1195, p = 0.04 and 14.16 ± 13.40 vs 6.74 ± 5.45, p = 0.02, respectively). There were no statistically significant differences according to HF symptoms, echocardiographic parameters, 6-MWT and NYHA class between analysed groups. Comparison of patients with DCM treated with atorvastatin with and without AF. * (1) variables assessed after inclusion, (2) variables assessed after 2 months. ABBREVIATIONS: TNF-α - tumour necrosis factor-alpha; IL - interleukin, 6-MWT - 6-minute walk test; EF - ejection fraction; NYHA - New York Heart Association; NT-proBNP - N-terminal pro-brain natriuretic peptide. The comparison of IL-6 level in AF and non-AF patients treated with atorvastatin. Two months after inclusion in the study, a statistically significant influence on NT-proBNP level was shown by: atorvastatin treatment (connected with lower level of NT-proBNP; p = 0.01), renal insufficiency and necessity of digoxin treatment (connected with higher levels of NT-proBNP). AF was associated with higher level of NT-proBNP at the beginning of observation but this influence was not observed after two months of atorvastatin treatment (table 3). Factors (non-measurable variables) which significantly influence NT-proBNP level. ABBREVIATIONS: NT-proBNP - N-terminal pro-brain natriuretic peptide. AF occurs in congestive HF with the frequency of 15 to 30% . In the study of Brembilla-Perrot et al. , the occurrence of fixed AF was not a factor inducing the occurrence of fixed ventricular tachycardia, nor did it influence the prognosis in patients with DCM. In the research by Parthenakis et al. , the occurrence of AF in patients with DCM was related to higher concentration of IL-6 (p = 0.001), TNF-α (p = 0.002), soluble tumor necrosis factor receptor inhibitor (sTNFRI) (p = 0.023), N-terminal atrial natriuretic factor (NT-ANP) (p < 0.001), NT-proBNP (p = 0.003), decreased exercise tolerance and lower maximum oxygen consumption at exercise peak compared to patients in sinus rhythm. Wojtkowska et al. , in patients with AF co-occurring with HF, showed lower physical efficiency as well as a higher number of hospitalizations. However, AF was not an independent risk factor of death. In the available literature, it was determined that after slower heart rhythm is obtained in tachyarrhythmic cardiomyopathy, a considerable improvement in left ventricular function is also obtained contrary to other kinds of cardiomyopathy in which the prognosis is bad . In order not to falsify the results of assessment of atorvastatin influence, the research included the patients (in the research group as well as in the control group) who were treated optimally pharmacologically for 3 weeks before the qualification. The average rhythm rate did not differ after inclusion in the research between the statin group and the group without statin and it was 78 beats/minute. The research did not include patients with tachyarrhythmia. After two months from inclusion in the research, no significant differences were found in heart rate within the groups and between the groups; pharmacological treatment was not modified during that time either. In order to assess whether the occurrence of AF influences the effectiveness of statin treatment and prognoses for patients with DCM, and if it does, how it influences them, patients with AF and non-AF patients were compared within the whole population and within the statin group. In patients with DCM and AF, higher levels of NT-proBNP were only determined when they were included in the research . The influence of AF on the level of NT-proBNP was also confirmed by data from the literature [20, 23]. In the author's own research, as a result of statin treatment, patients with AF obtained a considerably lower reduction of NT-proBNP and IL-6 levels than non-AF patients. No differences in echocardiographic parameters and clinical assessment were determined (NYHA class, 6-MWT, HF symptoms) in the groups with AF and without AF after statin treatment. The results of the MADIT-II (Multicenter Automated Defibrillator Implantation Trial II)  and DEFINITE (Defibrillators in Non-ischaemic Cardiomyopathy Treatment Evaluation)  studies showed a considerable reduction of morbidity rate and ventricular arrhythmia in patients taking statins. In the ADVANCENTSM (National Registry to Advance Heart Health) registry, treatment with statins was connected with a considerable reduction of AF occurrence . The registry confirmed that anti-arrhythmic influence of statins may be a result of their anti-ischaemic properties, stabilization of cell membranes, improvement of autonomous nervous system function, inhibition of triphosphatase Rac1 guanosine, counteracting the remodelling of the left ventricle and anti-inflammatory properties of statins . Based on the results of the author's research, it may be stated that advantageous effects were to a small degree a consequence of statins' immunomodulating activity - lower reduction of inflammatory cytokine levels in the group with AF. Factors influencing levels of NT-proBNP were assessed as well. The only cytokine among those examined the concentration of which positively correlates with the levels of NT-proBNP turned out to be IL-6. We also showed that cytokine activity was higher in the group of patients with co-occurring AF. As a result of statin treatment, a considerably lower reduction of IL-6 levels was obtained in patients with AF than in the non-AF group. In the research by Streitner et al., higher levels of IL-6 were related to occurrence of malignant ventricular arrhythmia in patients with an ICD . The importance of IL-6 was also confirmed in the study of Haugen et al., where in the group of elderly patients increased levels of inflammatory cytokines were determined; however, only the concentration of IL-6 was a predictor of early death . Our study has several limitations. The most important is the small number of patients in both groups (AF and non-AF), and the fact it is not a placebo-controlled study. In conclusion, in patients with DCM and co-existing AF, a weaker effect of atorvastatin concerning the reduction of IL-6 and NT-proBNP concentration was observed than in patients without AF. However, this interesting data on the decreased pleiotropic activity of atorvastatin in patients with DCM and AF, has to be confirmed in a placebo-controlled study with a larger number of patients [29–31]. ABD planned the study protocol, took care about the patients and coordinate the research, JHG was a medical patients consultant and participated in the sequence alignment, JR collect data and drafted the manuscript, MM carried out echocardiographic assessment, RD participated in the design of the study and performed the statistical analysis, WA participated in the design of the study and revised it critically for important intellectual content and MB conceived of the study, and participated in its design, and coordination. All authors read and approved the final manuscript.